The thriller stars Glenn Close and Michael Douglas. 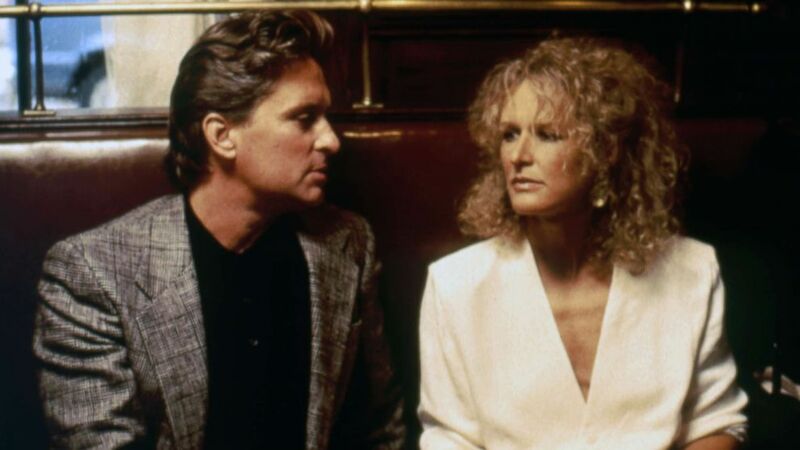 Thirty years ago today, "Fatal Attraction," the 1987 psychosexual thriller directed by Adrian Lyne and starring Michael Douglas and Glenn Close, arrived in theaters. The film followed Dan Gallagher, a guy who has a brief affair with a career woman named Alex Forrest. Alex then becomes obsessed with Dan and stalks him and his family, with deadly results. The movie's original ending had Alex frame Dan for her murder before killing herself. But when test audiences didn't like it, the studio reshot the ending, with Dan's wife, Beth, shooting and killing Alex — which Close initially protested. (Corbis via Getty Images) Michael Douglas and Glenn Close star in the 1987 film, "Fatal Attraction." "I fought it for two weeks. It was going to make a character I loved into a murdering psychopath," she recently told the New York Times. "My friend William Hurt said, 'You've fought your battle, now be a team player.' So I shot it. And I learned something. It's what the Greeks do. There's order in the family, then some element creates chaos, then order has to be restored. It's restored in tragedies through bloodshed. My blood was shed for order to be restored. It was cathartic for the audience." "Fatal Attraction" sparked much discussion and debate, with some arguing that the film demonized working women — "Absurd," screenwriter James Dearden told the New York Times — and some believing that it struck fear into the hearts of many men tempted to cheat. In a 1987 interview with "Good Morning America," Douglas acknowledged that what made the film so scary was that the situation "could happen to anybody." "I think that we all sometimes can have a moment of indiscretion," he said. "In the picture, there happened to be some extenuating circumstances that just were created at this particular moment at that time — 'I made a mistake.' And the picture's about paying for that mistake." "I'm proud my character elicited such a visceral response," Close told the Times. "Now she's considered one of the greatest villains ever, and that to me is a mistake. I've never thought of her as a villain, just in distress."